This intro page has only a few things different than the first version, but the redesign is all about the rest of the site found within. For instance, since I was brand new to iWeb for the first version of the site, I had no idea about centering the entire layout for each page, resulting in some wonky pages. Another thing I fixed: I didn't like having to scroll down a bit for each image in my Illustration portfolio. 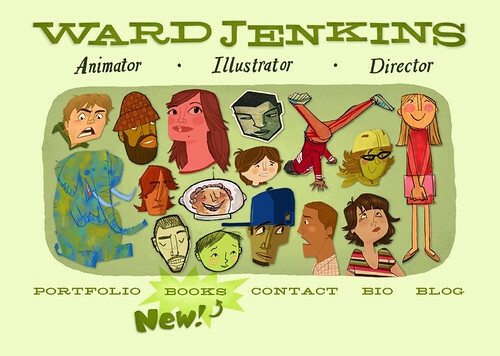 By shrinking the main header of "Ward Jenkins" and all the categories in the navigation bar at the top, I was able to keep it simple, allowing more space below. Now, practically all my portfolio images are viewable without having to scroll down. Besides the new Books section, I've also split up my Illustration section into two categories: Personal and Published. Took down some old stuff, put up a whole lot of newer stuff. Yes, an entire section devoted to my first children's book: How To Train With a T.Rex. You can check out some pages (as well as the sketches), lots of sketches on how I drew Michael Phelps, and, of course, the easter eggs found in the book. Since most who visit the Books section could possibly be kids, I'm thinking of creating an entire Kids section. Still need to mull it over, though, figure out the possibilities, how it would fit within the rest of the site. Ever see a cool commercial and wonder who made it? I do all the time, but that's because I've directed a few and have worked in the industry for some time. And after seeing said cool commercial, do you ever try to find out who made it by searching for the thing online? I do, but of course, that's just me. And when I do, I hit a brick wall almost every single time. Why is it so hard to find out who made a commercial these days? Especially during this day and age of social networking, of Google, YouTube, blogging, Facebook, Twitter, et al? Are production companies scared of these networks? Of sharing? Of getting their work out there? It's not the same for all of these companies, I'm sure. I see some ads (and entire ad campaigns) that are promoted to the hilt online. If it's done right, it gives a face to who makes them. A persona, if you will, and makes me more than curious to see what else they'll do. If it's done wrong, this self-promotion can come across as being gaudy and superficial. A thin line to cross, apparently. But I'm perplexed by the double standard of how production companies promote themselves. There's plenty of boasting about who they are and what they do on their websites, touting all the latest awards and recognition they've received, and how long they've been receiving these awards. Most will update their sites solely for the purpose of letting us know what they've done lately. If they're smart, they'll mention each of their directors with a list of all the ads these directors have done for the company. But all of this is for....who? Me? No, of course not. Potential clients, right? Problem with this type of promotion however is that it's blandly informative, not at all personable. The last two companies I worked for, I constantly talked with certain people about starting a company blog - one that would be regulated by the principles of the company, by someone who would know what to say and how to say it, to promote the company as an entity that had a face. A voice. A vision. But nothing ever came of it. I'm happy to say that since then, one of my former employers has started to embrace social networking through both Facebook and Twitter. No blog, but still, they've started to create a presence online, outside the usual incestuous circles that most commercial production companies usually confide themselves in. They mention the latest project they've recently completed and will occasionally post an interesting link or video. I like that. The other company is still faceless online. In fact, their website hasn't changed since its inception. That was 2005. Five years in the online world is like an eternity. No blog. No Facebook. No Twitter. What are they afraid of? These companies who eschew any sort of connecting online are missing the boat and make it extremely difficult for someone like me to be positive about what they're doing, even if what little they show is "cool." What are you working on, companies? What are you doing to get us, the AUDIENCE, to know about what you're doing? Do you realize that if you talk about your work outside of your industry and trade magazines and design award shows that maybe, just maybe, your current clients will like you even more? And, if you're a buzz generator, do you realize that more people (read: potential clients) might be interested in what you do? Thought I'd let you know that I'm this month's featured artist for the excellent online magazine, FLIP. Editor Steve Moore interviewed me about my style, how I approached my style, and my graffiti background. Hopefully I didn't ramble. Well, hopefully I didn't ramble too long. I'm very honored to be included in such a fine online publication! Many thanks, Steve!